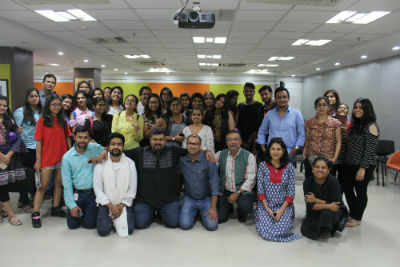 New Delhi: Pearl Academy organized a workshop and interaction with well-known artist Ruchin Soni at their Noida campus. Soni, who has a special interest in street art and murals, shared with the students his experiences in doing various street art projects. “Being a street artist, I take my work as a responsibility as it reaches out to the masses directly. But at the same time, I enjoy my work and the idea behind street art is to share a social message with the public,” the artist said during the workshop. The highlight of the workshop was the career advise by Ruchin to the students. He also encouraged the students on opting street art as a career option only if they are deeply inclined and passionate towards this kind of art. Pearl Academy aims to make its students industry ready. It is therefore important to introduce young minds to global cultures, languages, values and people. The interaction with Ruchin gave students an insight into a specialized art form. Ruchin has been a part of the Street Art Festival in Delhi since its inception. His work adorns the walls of urban village of Shahpur Jat, Rain Basera on Mahatma Gandhi Marg, as well as India’s longest mural at Tihar Jail in New Delhi. Besides, he has worked as a freelance graphic designer, illustrator and cartoonist for various companies including Indigo Airlines, Quicksand designs (BLOT), Thinking Design, I me am designs, Indsights, Arts 1st, Flow India and Toppers Academy, to name a few. “I was quite excited to attend his workshop as I have been following his work closely. Being an art lover at heart, attending the workshop was a great experience”, said a student of Pearl Academy.